Unified Communication as a Service (UCaaS) is an emerging technology that has rapidly garnered a lot of attention from developer communities and enterprises. The global UCaaS market is poised to witness a significant rise in demand for UCaaS solutions from enterprises and businesses keen on increasing the efficiency of existing processes. A number of these enterprises are now switching from traditional business processes to communications-enabled business processes. The value of the global UCaaS market was pegged at US$8.23 bn in 2015 and is projected to expand at an impressive CAGR of 29.4% from 2016 to 2024 to reach US$79.3 bn by the end of the forecast period. By deployment model, hosted UCaaS solutions led the market in 2015 and the segment is expected to retain its lead through 2024. This is mainly owing to the rising adoption of Internet Protocol (IP) telephony across the world. The low total cost of ownership (TCO) and major advancements in cloud communication platforms are also supporting the adoption of hosted UCaaS solutions across various industry verticals. Based on service, telephony services emerged as the key contributor in the UCaaS market. The segment is expected to continue its lead through 2024 thanks to the growing adoption of hosted telephony as a part of enterprise UCaaS solutions. 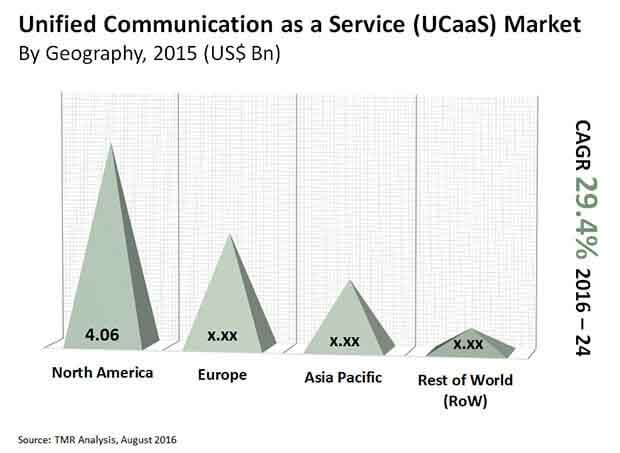 By delivery model, stand-alone services led the UCaaS market in 2015. However, by 2024, the revenue generated by the integrated services segment is expected to surpass that by stand-alone services. The rising demand for integrated services across various businesses is likely to bring about this shift. Geographically, North America headed the global UCaaS market in 2015 and the region is expected to continue to be the leading revenue generator throughout the forecast period. This growth can be attributed to the presence of a massive tech-savvy workforce and advanced network infrastructure in the region. The demand for UCaaS is likely to increase in the coming years as vendors invest in sectors such as banking, financial services, and insurance (BFSI), consumer goods, retail, transportation and logistics, and telecom. This is likely to open up new offerings for UCaaS. Asia Pacific is forecast to be the most rapidly growing market for UCaaS owing to the rising inclination of large companies toward UCaaS solutions. The region also presents immense opportunities for the establishment of contact center services due to a growing population proficient in the English language. Asia Pacific is a lucrative option for various businesses due to the availability of a comparatively cheaper workforce and rapid growth in emerging economies such as India and China. Campaigns such as ‘Make in India’ have led to the establishment of offices and manufacturing units in India, which is anticipated to further the need for UCaaS to stay connected with the headquarters situated at a different location. Moreover, the introduction of new mobile phones and tablets is going to increase the demand for unified communication in this region. Cisco Systems, Inc., Avaya, Inc., IBM Corporation, Microsoft Corporation, Alcatel-Lucent SA (Nokia Networks), Unify, Inc. (Atos SE), Hewlett-Packard Development Company, L.P., Polycom, Inc., Fuze Inc., 8x8, Inc., West Corporation, Verizon Communications, and Avanade Inc. are some of the key players offering UCaaS solutions. The global unified communication as a service (UCaaS) market is prophesized to attract growth on the back of the need to switch from traditional business to communication-enabled business processes. Such a switch is expected to enhance the efficiency of various business operations. UCaaS is an emerging, ready-to-go technology that is permanently updated, pre-integrated, and standardized. The service leads to improved productivity and accelerated decision-making keeping the cost low. The report foresees the global UCaaS market to be appropriately segregated as per deployment model, deployment type, service, end user, and delivery model. Hosted UCaaS solutions comprised as a part of the segmentation by deployment model are expected to be a major contributor to the market growth. The researchers of the report have included an in-depth analysis of the global UCaaS market coupled with a focus on its competitive matrix. Each region of the market has been carefully studied to unveil hidden opportunities and growth prospects likely to show face in the coming years. The world UCaaS market is expected to gain momentum and obtain strength to capture major growth prospects due to a significant rise in the number of people using mobile phones worldwide. As businesses spread across the globe, the need to communicate with each other effectively across the border has significantly augmented. Collaboration tools that could provide with improved and effective communication between employees are the need of the hour. As such, the need for UCaaS solutions rises thereof. However, the market is restrained by the lack of knowledge and awareness about UCaaS. The emergence and increasing popularity of bring your own device (BOYD) trend has bolstered the growth of the world UCaaS market. UCaaS solutions not only provide improved services but also tighten security and enhance reliability, especially that of corporate devices. Furthermore, with the phenomenal penetration of mobile phones on a global platform, the market for UCaaS is prophesized to obtain an immense opportunity for growth. So far as regional dominance is concerned, North America leads the market for UCaaS and is prophesized to retain its dominance during the forecast period. Much of the growth of the region is attributed to the well-developed network infrastructure and tech-savvy workforce. Asia Pacific, on the other hand, is also anticipated to embrace a highly lucrative growth in the market. A rising number of businesses are making a move toward the adoption of UCaaS solutions. Availability of a cheap and large workforce proficient in globally recognized languages and customer service could offer scores of opportunities for the establishment of contact center services, thereby adding to the demand for UCaaS. The report also offers a study on other important regions of the international UCaaS market, viz. the Middle East and Africa (MEA) and Europe. Some of the vital companies worth studying their business strategies and growth path in the worldwide UCaaS market are IBM Corporation, Alcatel-Lucent SA (Nokia Networks), Verizon Communications, Packard Development Company, L.P., Avaya, Inc., West Corporation, Microsoft Corporation, Hewlett- Polycom, Inc., Unify, Inc. (Atos SE), Cisco Systems, Inc., and Avanade Inc. The report provides a deeper insight into the nature and other fundamental characteristics of the competitive landscape.